Once again this Christmas season, there is a simple but beautiful and helpful way to see that as many children as possible within our community have a Christmas present(s). 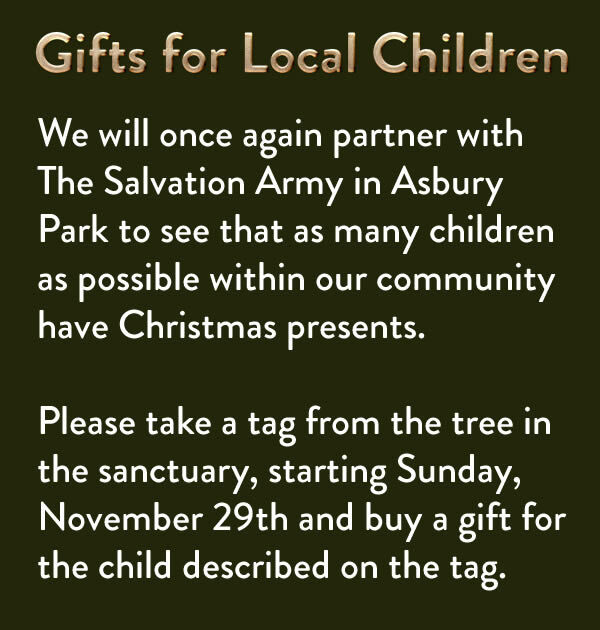 We will once again partner with The Salvation Army in Asbury Park. This year, our Salvation Army Tree contains 100 names of local boys and girls for whom you have the privilege of making a brighter Christmas as well as meeting the challenge of putting your faith into action. The tree will be in the sanctuary the Sunday after Thanksgiving or November 29th. 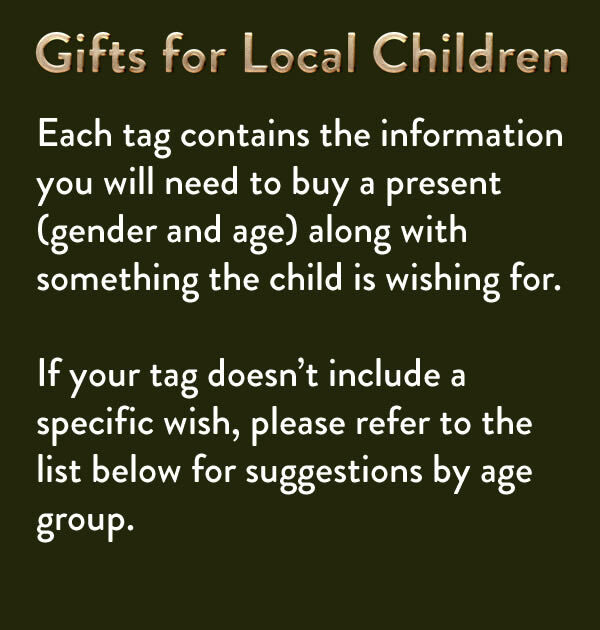 Simply take a tag from the tree and buy the child an appropriate gift; each tag contains the information you will need to buy a present along with something the child is wishing for (gender, age and gift request). If there is not a specific wish, please refer to the toy list below for suggestions by age group. Please bring your unwrapped gift back to the church with the angel gift tag affixed to it and place under the tree. ALL GIFTS ARE DUE BACK AT THE CHURCH BY SUNDAY, DEC. 13TH. If the toy requires batteries, please include them. Again, do not wrap the gift!! If you have any questions, please call Tom or Arlene Malanga at 732-686-9672. On behalf of the many children for whom Christmas will be brighter because of YOU, we say thank you and God bless you for being an angel! Girls – 6-8 years – Barbie Dolls & accessories, Bratz Dolls & accessories, Disney Princess items, Polly Pocket toys, Littlest Pet Shop toys, LeapPad toys, Clue Jr., Monopoly Jr., Scrabble Jr.